Eamonn Dorling did well for PAC. 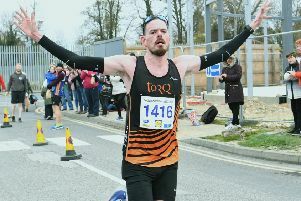 Nene Valley Harriers men gained revenge over city rivals Peterborough AC in round two of the Eastern Veterans League at the Ebankment, writes Barry Warne. Harriers were keen to avenge their narrow defeat at the hands of PAC in the opening round, and after an exciting evening of athletics they did so by 10 points. As usual Nene Valley were strong in the throws with Simon Achurch comfortably winning the discus and shot in his 35-49 age group, while Tim Needham won the Over 60 discus. Sean Reidy (35) was dominant for them on the track and in the jumps. He featured in one of the evening’s highlights when winning by a hair’s breadth from big PAC rival Matthew Dalton in the 110m hurdles. Reidy also took maximum points in the long jump and high jump. Ricky Huskisson won the 50-59 200m in 28.1 while Julian Smith and John Spriggs were runners-up in the 35-49 and Over 60 sprints respectively. For PAC, the ever reliable Eamonn Dorling was first in the Over 60 800m and 1500m and Karl Eve was successful in the 50-59 high jump and was runner up in the discus. Peter Ward (51) was second in the 800 and 1500m. PAC were outstanding in the ladies competition winning comfortably. Star of the show was Judith Jagger winning an incredible five events (high jump, long jump, 80m hurdles, shot and discus) in her 50-59 category. Wendy Dunn won the 50-59 200m in a time of 31.7 while 43 year-old Lisa Richardson was first in the 100m hurdles and high jump as well as coming second in the long jump and discus. For Nene Valley, Phillipa Taylor won the 1500m in a fine 4:58.1, Claire Smith won the 35-49 200m and Andrea Jenkins easily won the shot and discus in that age group. Men - 1 Nene Valley 98pts; 2 Corby 88.5pts; 3 Peterborough 88pts; 4 Huntingdon. 72.5; 5 Stamford Striders 48pts; 6 Wellingborough 28pts. Women - 1 Peterborough 85pts; 2 Wellingborough 69pts; 3 Stamford Striders 50pts; 4 Corby 45pts; 5 Nene Valley Harriers 25pts; 6 Huntingdon 19pts.